Update - Bhagawan Sri Sathya Sai Baba breathed His last on 24th April 2011. Sri Sathya Sai Baba is one of the most revered spiritual leaders of India. He has millions of followers from India and abroad. He was born on the 23rd of November 1926 at Puttaparthi to Peddavenkama Raju and Eswaramma in an agrarian family. His name was Satyanarayana Raju. In May 1940, at the age of 14, he had some weird experiences and he proclaimed himself to be a reincarnation of the fakir and saint Sai Baba of Shirdi and subsequently took the fakir's name, Sai Baba. He has established an Ashram in Puttaparthy, a small village in Ananthapur District of Andhra Pradesh. This Ashram is called "Prasanthi Nilayam" (abode of eternal peace). Prasanthi Nilayam was established on 23rd November 1950, 25th Birthday of Sri Baba. The Ashram complex consists of beautiful temples, a kalpavriksha (wish-fulfilling tree) a meditation tree and a Darshan hall, where Sathya Sai Baba meets his devotees. The Ashram can accommodate thousands of people. The daily program at Sathya Sai Baba's temples usually begins with the chanting of "OM" and a morning prayer (Suprabatham). This is followed by Veda Parayan (chanting of the Vedas), nagarasankirtana (morning devotional songs) and twice a day bhajans and darshan. During this time, Sri Baba walks around or is wheel-chaired around amongst his devotees. Prashanthi Nilayam is a well designed and a systematic ashram with a free school and a deemed university, as well as a super specialty hospital with good facilities. The activities at the ashram start in the morning at around 4 am and stops in the night at 9 pm. The Ashram is quite only for two hours after lunch, otherwise it is bustling with activities and programmes throughout the day. He has created spiritual waves in the minds of millions of people in this materialistic world. People come here all over the world for his darshan and blessings. His work and teachings have attracted the attention and admiration of intellectuals like scientists, educators, and world leaders, as well as people from all walks of life including the poor and distressed. A person may follow any religion, but he must do it utmost devotion. Always respect your country and abide by its laws. God is one, but His names are different. Serve the poor, the needy and the sick, without expecting anything in return. The values of truth, divine love, right conduct, peace and non-violence should be followed and promoted. Brindavan Ashram of Shri Satya Sai Baba is situated in Whitefield, on the outskirts of Bangalore. The third Ashram is in Kodaikanal, a beautiful Hill of South India. Sri Sai Baba gives darshan to his devotees twice daily. During that time he walks through the people with his radiating blessings, distributing sweets and Vibhuti. 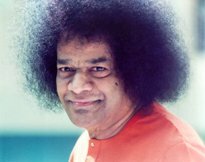 Sai Baba's mission is to bring love to the world and to lead us to a deeper awareness of the unity of all people and faiths. Visitors are allowed to see the devine supreme shri sathya sai baba from Morning 6.30 to 8.00 am and they can witness the prayer with sai baba from 9.30 to 10.30 am. Again Bhajan starts 5.30 pm till 7.00pm.